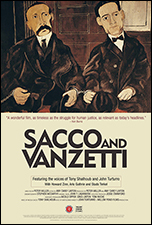 SACCO AND VANZETTI brings to life the story of two Italian immigrant anarchists who were accused of a murder in 1920, and executed in Boston in 1927 after a notoriously prejudiced trial. The ordeal of Nicola Sacco and Bartolomeo Vanzetti came to symbolize the bigotry and intolerance directed at immigrants and dissenters in America, and millions of people in the U.S. and around the world protested on their behalf. Decades later, the story continues to have great resonance, as America once again grapples with issues of civil liberties and the rights of immigrants. SACCO AND VANZETTI dramatically interweaves the political and personal stories of the two men and their seven-year legal ordeal. The powerful prison writings of Sacco and Vanzetti are read by actors John Turturro and Tony Shalhoub. A chorus of passionate commentators propels the narrative, including Howard Zinn, Studs Terkel, Arlo Guthrie, and a number of older people with personal connections to the story. Through the tragic story of Sacco and Vanzetti, and the inspiring images of those who keep their memories alive, the film presents a universal – and very timely – tale of official injustice and human resilience. © 2006 Peter Miller Films, Inc.
Excerpts from THE LETTERS OF SACCO AND VANZETTI, edited by Marion D. Frankfurter and Gardner Jackson, Copyright The Viking Press, Inc. 1928, renewed 1956. Used by permission of Viking Penguin, a division of The Penguin Group (USA), Inc.
CENTER FOR MIGRATION STUDIES OF NEW YORK, INC.
MASSACHUSETTS CITIZENS AGAINST THE DEATH PENALTY FUND, INC.